A rare clip with scenes taken at a ceremony at the Syonan Jinja (from 1:23 to 3:30 in the clip), a shrine built during the Japanese Occupation with POW labour. The shrine was to have been a most beautiful of shrines with pebbled streams, stone lanterns, a stone stepped paths and torii gates and set in a 1,000-acre park with public recreational and sporting facilities. 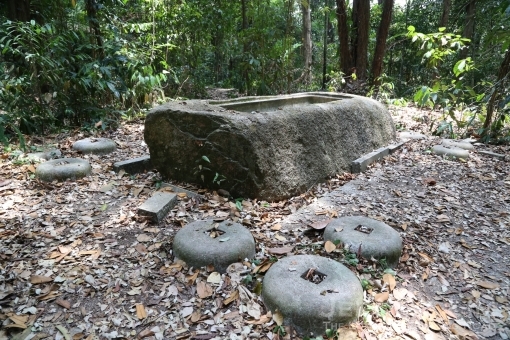 Pebbles, intended for the water filter beds at Bukit Timah, were diverted for its use. A new city was also to have been built around it. The grand plans were cut short with Japan’s defeat in the war and the shrine was destroyed before the British returned for fear of its desecration. More on the shrine can be found at this post: Lost places – the shrine across the Divine Bridge. The opening of the Syonan Jinja in 1943 (source: http://www.himoji.jp/himoji/database/db04/images_db_ori/2200.jpg). 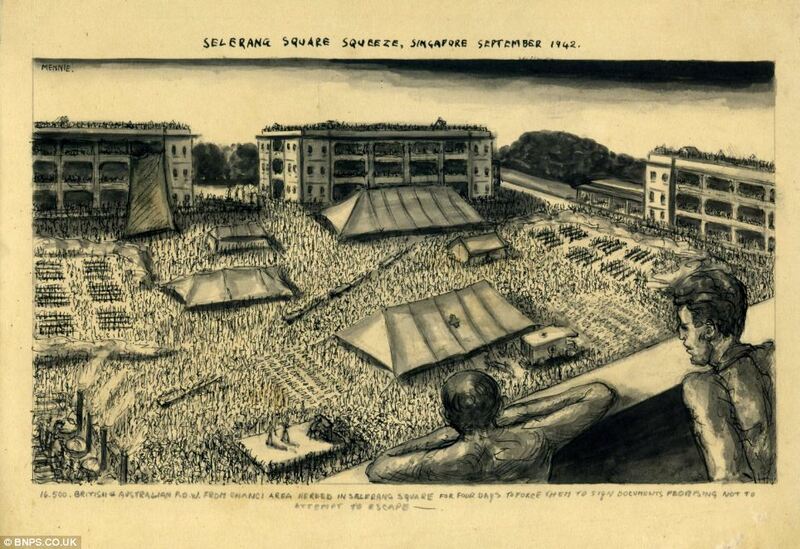 The clip apparently shows a ceremony taking place at the Syonan Jinja on 15 February 1943, the first anniversary of the Fall of Singapore, that involved children seen who had returned from civilian camps they were sent to in New Dehli in India when the war in the Far East broke out. 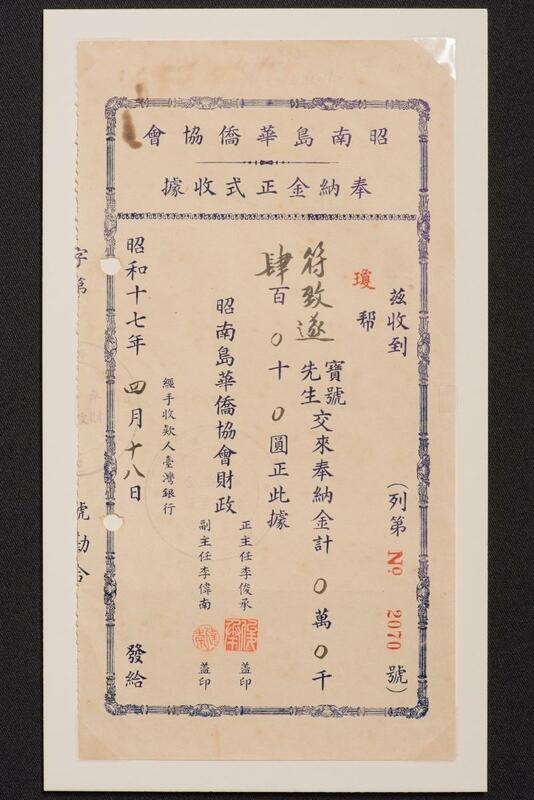 A movie clip showing a ceremony taking place at the Syonan Jinja on 15 February 1943, the first anniversary of the Fall of Singapore, can be viewed at this link. The children seen in the clip were ones who had returned from civilian camps they were sent to in New Dehli India when the war in the Far East broke out. The Japanese couldn’t have picked a more divine setting in Singapore for the Syonan Jinja (昭南神社), the Light of the South Shrine that was to be the grandest of Shinto shirnes erected in the southern reaches of the empire. Even today, despite its site having been reclaimed by the forest , it is not difficult to find the beauty and peace the site was chosen for, in an area that even today does seem far removed from the urban world. The site of the Syonan Jinja where remnants of what was once South-East Asia’s leading Japanese Shinto shrine is today an eerie yet peaceful spot. What is seen in the photograph is one of the more visible remnants, a sacred granite water trough for ritual purification. 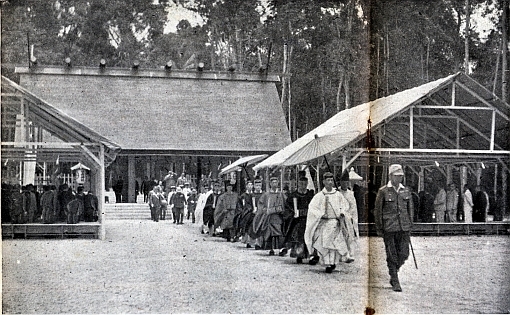 A worship ceremony involving Japanese troops at the opening of the Syonan Jinja in 1943 (source: http://www.himoji.jp/himoji/database/db04/images_db_ori/2200.jpg). 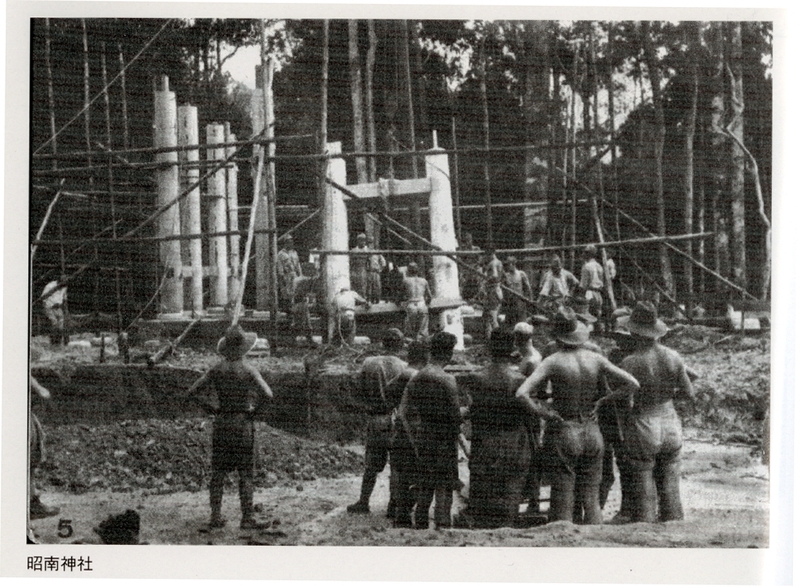 The shrine, built with labour provided by the Allied prisoners-of-war (POW), was one of several that came up in Singapore during the Japanese occupation. One of two of the more notable shrines – another was the Syonan Chureito on Bukit Batok, the Syonan Jinja stood on a slope of a hill that rose from the water’s edge around the western reaches of MacRitchie Reservoir, across a what from the evidence presented in photographs of it, was a beautifully crafted bridge, known as the Divine Bridge. 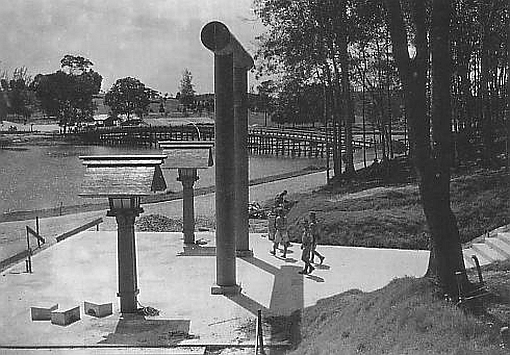 The Torii Gate at the bottom of the stairway leading up to the Syonan Jinja as seen in 1943 with the Divine Bridge in the background (source: Mainichi Newspapers Company, http://upload.wikimedia.org/wikipedia/commons/3/3d/Shonan_Shrine.jpg). 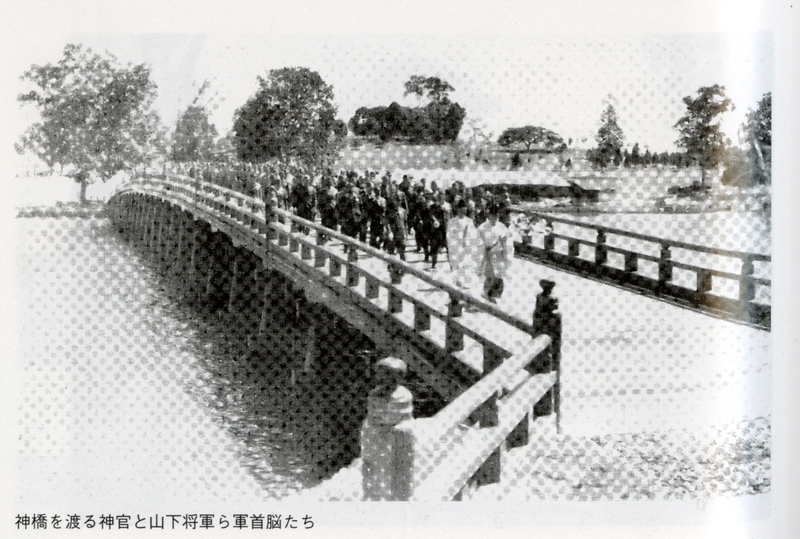 General Yamashita and Japanese troops crossing the Divine Bridge at the opening of the shirne (source: http://www.himoji.jp/database/db04/images_db_ori/shinjin_207.jpg). What remains of the Divine Bridge today – wooden stumps in the water that were part of the columns that supported the bridge. Little today is left for us to see of what it might once have been – wooden stumps, only visible when the reservoir’s water levels are low enough, tell of of the location of the Divine Bridge and where the Torii gate and the stairway up to the shrine would have been. Across the reservoir, it is through the thick undergrowth of the secondary forest that has reclaimed the area, that one finds the flight of stairs, rising first to a terrace on which a water trough hewn out of a block of granite still stands. The trough would have served to hold water for the ritual purification asked of visitors to the shrine. A retaining wall around the terrace on which the trough is found. A panorama of the site (click to enlarge). Beyond the trough, the stairway leads to another platform – the main site of the shrine and except for a few slabs of stone lying around and the platform itself, there is little but that sense of an uneasy calm that one does feel at the site of the shrine, which was destroyed before the Japanese surrender to prevent it from being desecrated. Granite slabs at the site. The platform for the shrine seen in the forest. Some of what we do know of what did go on at the shrine, comes through the accounts of local residents who participated in some of the rituals that did go on. One practice that did get mentioned is that of the Japanese community’s visits first to the Syonan Jinja to participate in Shinto rites early in the morning on New Year’s Day, before they made their way to the Syonan Chureito to pay respects to the war dead, an observance that also involved employees of the Japanese and would be followed by a lavish lunch (see “The Last Days of the Japanese Occupation”, The Straits Times, 5 Sep 1976). One of the things about the shrine does does come out in some of the accounts is of the pebbled streams in what must have been a beautifully landscaped area. The pebbles, ” four, five tons” of them, as is described in one account, were apparently ones that had been had been brought in from Borneo for the Bukit Timah rapid gravity filter beds that were being constructed. A close up of the foundations. A view of the stairway. The site does attract a fair amount of interest despite it being rather difficult to access. 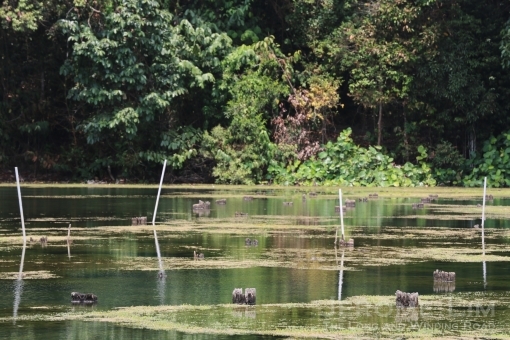 It has been designated as a Historic Site since September 2002 and a marker / information plaque on it can be found at the junction of Sime and Adam Roads – from which it is an over 2 kilometre walk that does take one through parts of the gravel paths in the MacRitchie forest, as well as along the water’s edge past what is some of the most picturesque landscapes to be found in Singapore.and for that alone, it is well worth the effort involved. POWs provided the labour to build the shrine (source: http://www.himoji.jp/database/db04/images_db_ori/shinjin_206.jpg). Note: I have been advised that the area around the Syonan Jinja has since been rendered out of bounds by NParks. This is in an effort to protect the pristine forest found around the site of the former jinja.